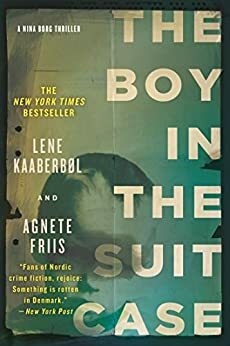 Nina Borg finds herself in the middle of a dangerous mystery when she collects an old suitcase from a public locker in Copenhagen for her estranged friend, Karin. The suitcase is extraordinarily heavy and when Nina opens it to see why she discovers a naked, three year old boy who is drugged but alive. One of her co-workers at the Red Cross will help her revive the boy but will go no further to help her find out who he is, who put him in the locker and who is trying to hunt him down. Her friend, Karin is discovered brutally murdered and Nina realizes that her life and the boy’s are in danger too. The book addresses the issue of child trafficking in Europe with a strong story line and a well developed plot. The crisis and turning point 2/3 of the way through the book amps up the excitement with a plot twist, leading to a satisfying ending. This novel is translated from its original Danish to a not quite perfect English. At first I was critical of the misinterpretations of the fine nuances of English but have since decided that this gives the work a foreign-film flavour that enhances its over all ambiance. Lemony Snicket is working his apprenticeship as a detective with the most inept chaperon to ever grace the annals of detective-hood. The 12 year old boy intentionally chose S. Theodora Markson from the bott om of the list of available overseers so that he would have time to solve a second mystery at the same time as working to solve the case at hand. Unfortunately, he is required to leave the city to work with his female mentor and is unable to assist his cohort back home. He uses his “expert and unusual education” to get himself out of the many dangerous situations he and his chaperon find themselves in. Lemony has a tendency to ask the wrong questions, but eventually finds all the right answers. A great book for children aged 10 – 13. This hilarious children’s counting book is all about counting the monkeys, however, they are very elusive! Throughout the story, readers encounter four grizzly bears, two mongooses, seven wolves, nine lumberjacks, but not one single monkey. Apparently, they’ve all been chased to the end papers. Each page has a creature/character that frightens the monkeys off the page, and each page has an action or interactive component for children to keep them not only engaged, but highly entertained as the story is read to them. This story is brightly illustrated with fun details. It is perfect for reading aloud to young pre-school and kinder-aged children and would be great both for reading one-on-one, and for reading to larger groups of children or in a classroom or library setting. This book is as entertaining for the adult reading it aloud as it is for the children listening, it’s a book you could read again and again! This novel is a perfect blend of fantasy, sci-fi, steampunk and historical fiction. Daniel Wilson provides a history lesson spanning some two hundred years in the guise of a very entertaining read. The fast paced page-turner seamlessly brings together figures from the era of Peter the Great and modern North American society as well as taking a miraculously congruous side trip to present day China with speculation about the real nature of the armies of clay soldiers found in mountain caves there. The idea of artificial intelligence is forwarded as definite possibility with the use of automatons who are not only fully aware mentally but who also operate with believable, complete, emotional involvement and interaction with our human species throughout the novel. Wilson’s masterpiece begins with a running start in the prologue and his pace never flags until a whirlwind, satisfying ending. I highly recommend this read for lovers of all the genres included in The Clockwork Dynasty.